Just the right amount of whimsy mixed with a perfect dose of classic vintage. I’d paint my walls in a pale blush or lilac blue hue. Hubby wouldn’t be too happy, but that’s why there are mancaves. Let’s talk about a few of the hotties on this list. I’ve always wanted a blue velvet couch. I’m obsessed with anything in that material, clothing included. It’s such a rich, luxe look, yet there’s something a little Boho about it. 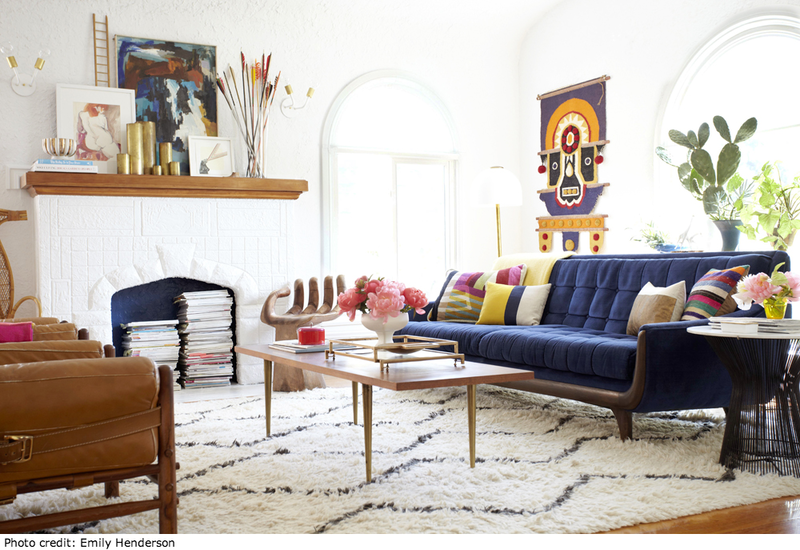 This image from Emily Henderson contains the ultimate blue velvet couch. Actually, it contains the ultimate living room. Correction: THIS would be my living room. The Aztec style wall hanging was among the first items to go when she had her inaugural moving sale with Chairish last year. Meow. But since it’s Emily Henderson’s living room, let’s get back to the one that would be mine if I didn’t already have one. I luuurve a clear coffee table to give the illusion of a bigger room, but I’m not a fan of glass top tables. A plastic (I like to call them lucite) table is safe, sturdy, and a great way to store stacks of magazines or books, as seen in this Apartment Therapy shot. And did you notice the yellow dog silhouette throw pillow?!? 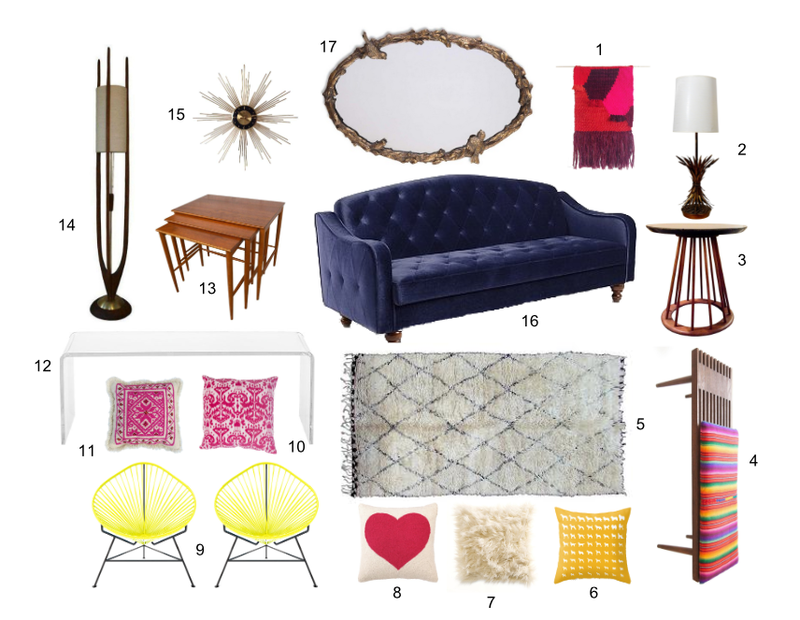 It’s dangerously close to being a part of my current living room. I’m also breaking a sweat for those yellow Acapulco chairs. But wait…there’s more! 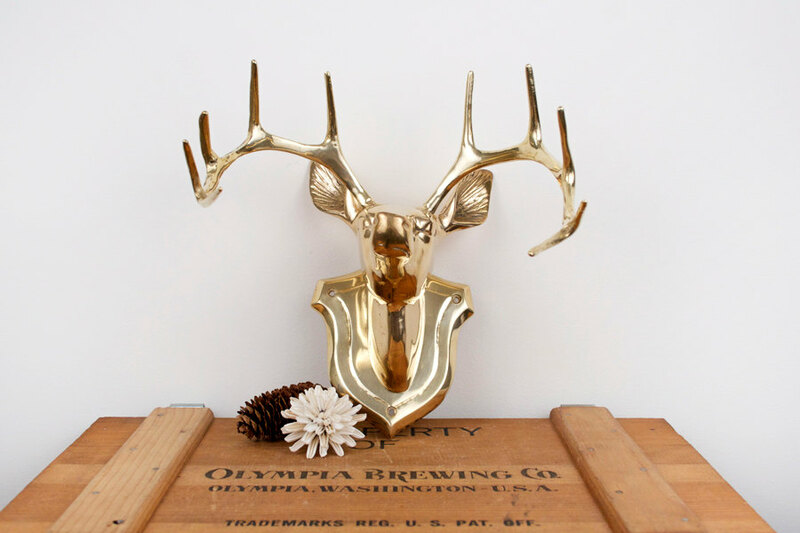 I spotted this brass deer head wall mount after I put the collage together. IN.LOVE. But alas, I will hide my wallet and pine away…. I’m dying to know: am I alone in my hopeless pursuit not to hoard or consume? Or are there others like me who are torn between retail abstinence and taking that euphoric swipe of the credit card? And if so, what’s on your crack wish list? I love Velvet right now. I want something similar to what Emily’s got in hers….only in ORANGE!!!! I think she one the “Homies” for her blog this year. Lucite is a great idea for function that doesn’t take up much visual space. You’re not alone in your pining! You had me at orange velvet!! !